In wireless sensor networks, energy and communication bandwidth are precious resources. Traditionally, layering has been used as a design principle for network stacks; hence routing protocols assume no knowledge of the application behavior in the sensor node. In resource-constrained sensor-nodes, there is simultaneously a need and an opportunity to optimize the protocol to match the application. 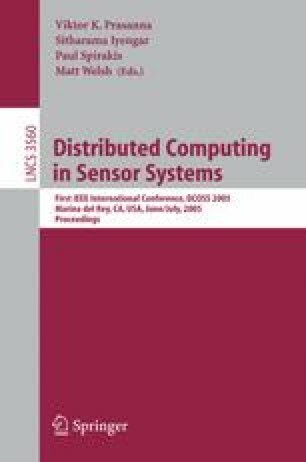 In this paper, we design a network architecture that efficiently supports multi-scale communication and collaboration among sensors. The architecture complements the previously proposed Abstract Regions architecture for local communication and collaboration. We design a self-organizing hierarchical overlay that scales to a large number of sensors and enables multi-resolution collaboration. We design effective Network Programming Interfaces to simplify the development of applications on top of the architecture; these interfaces are efficiently implemented in the network layer. The overlay hierarchy can adapt to match the collaboration requirements of the application and data both temporally and spatially. We present an initial evaluation of our design under simulation to show that it leads to reduced communication overhead, thereby saving energy. We are currently building our architecture in the TinyOS environment to demonstrate its effectiveness.